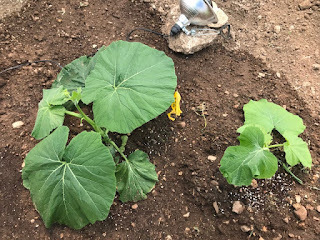 Giant Pumpkin Growing Tips From The Pumpkin Man: The Pumpkin Plants are in the Ground; Let's Role! 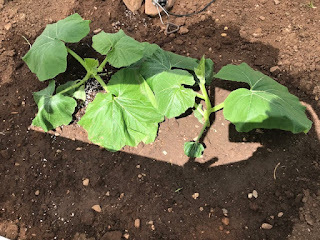 The Pumpkin Plants are in the Ground; Let's Role! I've finally gotten the pumpkin plants in the ground. Yea! Forecasted night time lows was for 35 degrees the last two nights and even with heat lamps I didn't want to risk it. Probably was a good idea. Power went out around 5:30am today for a short bit. This is my 2145 and a weak 1974 in this hoop house. I'll got with the best plant. I'm guessing it won't be a hard decision for this one. That 1974 took twice as long to do anything. Was late germinating, late popping through the soil and slow growing since. The other two 1974 plants have looked very good however. Not all seeds are created equal. These 1974 plants I think will also make for some nice plants. The 2145 is the biggest, leaf wise so far, but the root systems on all three seemed fairly equal.